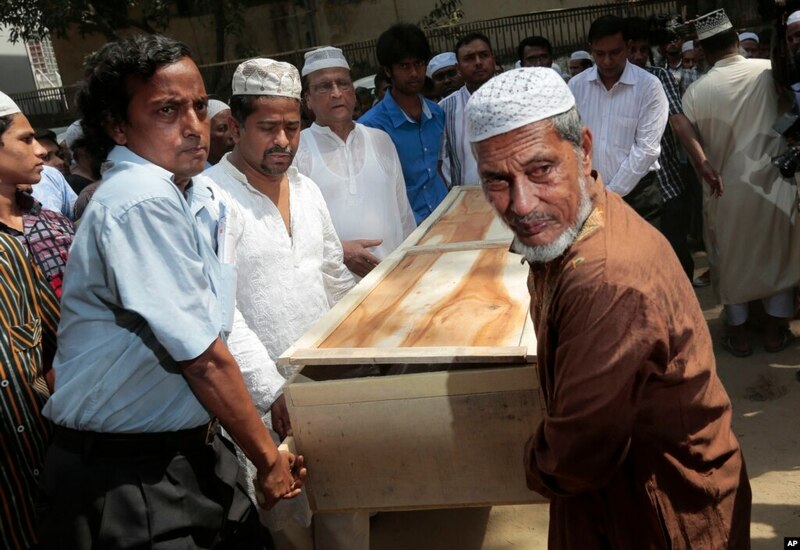 FILE - Bangladeshi Muslims carry the body of Xulhaz Mannan for his funeral in Dhaka, Bangladesh, April 26, 2016. Police in Bangladesh say they have arrested a suspected Islamist extremist in connection to the brutal deaths of a gay activist and his friend. The victim, Xulhaz Mannan, editor of Bangladesh’s first gay magazine, and Tanay Majumder, a fellow gay activist, were hacked to death in a Dhaka apartment last month by at least six men who stormed in with machetes and machine guns. Mannan also worked for the U.S. Agency for International Development (USAID). Police detained the suspect, Shariful Islam Shibab, early Sunday, according to a statement from Dhaka police spokesman Maruf Hossain Sardar. Shibab was identified as a member of Ansarullah Bangla Team, an Islamist militant group that claimed responsibility for the killings. His arrest came a day after a 70-year-old Buddhist monk was similarly hacked to death by Islamic extremists armed with machetes at a remote monastery in Bangladesh. It was the seventh attack of the same nature that’s taken place since the beginning of last month. The monk’s murder is the latest in a series of brutal killings of liberals, academics, bloggers, foreigners and religious minorities that has spread deep fear in Bangladesh and raised worrying questions about whether the secular traditions of the moderate Muslim country are under threat from extremist Islamic groups. Affiliates of Islamic State and al-Qaida have claimed responsibility for almost all the attacks, but the government says these groups have no presence in the country and blames homegrown militant groups.